(Newser) – After downing a cheeseburger and a handful of drinks Sunday evening, Paul Rater called home and ordered his wife to come get him, the Maricopa County Sheriff's Office says, per the Arizona Republic. 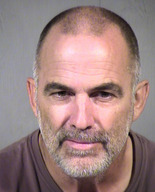 But instead of his wife showing up at the South Buckeye Equestrian Center, the cops did—and hauled him into a Maricopa County jail on child endangerment and abuse charges for allegedly leaving his 5-year-old granddaughter alone in the desert with a peculiar and perilous set of instructions. "She was given [a] gun and told to shoot any bad guys," Sheriff Joe Arpaio tells Reuters. "I don't know how a 5-year-old can tell a good guy from a bad guy, but that's what she said she was told." Deputies say the girl had been reported missing about four hours after she went out Sunday afternoon with her grandpa in his pickup truck. Boker: who mentioned anything about the NRA? that is like blaming AAA for the guy's truck being left in the desert or the phone company because he left his phone at home. He's definitely raising her to be a badass, lol. A "bar/restaurant/feed store". I really did LOL.